"Homemade, fluffy spaetzle perfectly paired with soup or chicken paprikash!" Mix flour, water, eggs, salt, and baking powder in a bowl until blended. Bring a large pot of water to a boil. Place part of the dough into a spaetzle press or potato ricer. Press dough into boiling water; cook and stir until pasta floats, about 2 minutes. Remove with a slotted spoon and rinse with water; repeat with remaining dough. I didn't have a spätzle press or a river so I tried to drop in small globs off a spoon and I found they were really watery. I'm not sure what happened. Great Taste and easy to make. Served it with pork schnitzels, gravy and corn on the cob! I halved the recipe. German Hubby love it-will definitely make it again! This recipe seems very good. 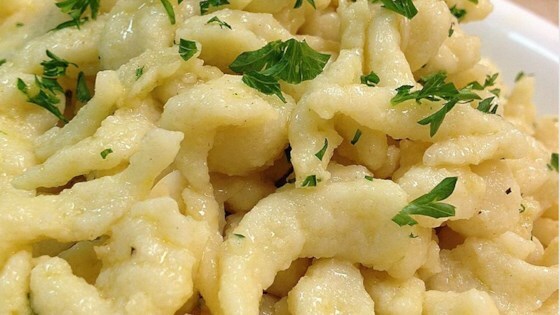 I am looking to make spaetzle and will most likely use this recipe!